Conrad II (c. 990 – 4 June 1039), also known as Conrad the Elder and Conrad the Salic, was Emperor of the Holy Roman Empire from 1027 until his death in 1039. The founder of the Salian dynasty of emperors, Conrad also served as King of Germany from 1024, King of Italy from 1026, and King of Burgundy from 1033. Conrad continued the policies and achievements of the Ottonian Henry II regarding the Catholic Church and the affairs of Italy. Conrad continued to build the Church as a center for imperial power, preferring to appoint church bishops over secular lords to important posts across the Empire. Like Henry II before him, Conrad also continued a policy of benign neglect over Italy, especially for the city of Rome. His reign marked a high point of the medieval imperial rule and a relatively peaceful period for the Empire. Following the death of the childless King Rudolph III of Burgundy in 1032, Conrad claimed dominion over the Kingdom of Arles and incorporated it into the Empire. The three kingdoms (Germany, Italy, and Burgundy) formed the basis of the Empire as the "royal triad" (regna tria). The Salian dynasty has its origins with Count Werner V of Worms, a mid-level Frankish noble from Germany's Duchy of Franconia east of the Rhine River. His son, Conrad the Red, succeeded him as Count in 941 and King Otto I of Germany (the future Holy Roman Emperor) appointed him as Duke of Lorraine in 944. He was subsequently married to Liutgarde, one of Otto's daughters, in 947 and became one of the king's closest allies. The relationship was strained, however, when Otto refused to honor a peace treaty Conrad, as Otto's representative, had conducted with the rebellious Berengar II of Italy. Conrad also resented the growing influence of Otto's brother Henry I of Bavaria, which he saw as threatening his own power. In 953 Conrad joined the king's son Liudolf in rebellion against Otto, but the rebellion was defeated and Conrad was stripped of his duchy. Conrad and Otto were soon reconciled, with Conrad fighting for Otto in the great Battle of Lechfeld in 955. Though the Germans were successful in halting the Hungarian invasions of Europe, Conrad lost his life in the battle. Conrad was succeeded as Count of Worms in 956 by his son Otto of Worms, a grandson of Otto I. Sometime between 965 and 970 Otto of Worms' oldest son, Henry of Speyer, was born. Little is known of his life as he died the age of 20 between 985 and 990. Conrad II's father was Henry of Speyer, and his mother was Adelaide of Alsace, an area of Upper Lorraine. After Henry's death, Adelaide married a Frankish nobleman. After her remarriage, Adelaide demonstrated no close relationship with her son. In 978 Emperor Otto II appointed his nephew Otto of Worms as Duke of Carinthia after deposing the rebellious Duke Henry I of Carinthia during the War of the Three Henries. Upon receiving the ducal title, however, Otto lost his position at Worms, which was given to Bishop Hildebald, Otto II's imperial chancellor. When Otto II died suddenly in 983, his infant son Otto III succeeded him, with his mother Theophanu serving as regent. Theophanu sought to reconcile the imperial house with Henry I, restoring him as Duke of Carinthia in 985, with Otto of Worms allowed to regain his ancestral position as Count of Worms. However, Otto was allowed to style himself "Duke of Worms" and his original territory was expanded so as not to diminish his rank. Otto of Worms remained loyal to the new Emperor, receiving rulership of the March of Verona in 955, though the actual Duchy of Carinthia passed to Henry IV of Bavaria. In 996, Otto III appointed Otto of Worms's son Bruno as Pope Gregory V. When Emperor Otto III died in 1002, both Otto of Worms, Conrad's grandfather, and Henry IV were candidates for election as King of Germany. In a compromise, Otto withdrew and received the Duchy of Carinthia from the newly elected Henry IV, who ruled as Henry II of Germany, in return. As a result, Otto of Worms renounced his holdings in Worms to Bishop Burchard of Worms, a long-time political rival. Buchard assumed care for Conrad, providing his education and upbringing by 1000. After the early death of his uncle Duke Conrad I of Carinthia, the elder Conrad's infant son, Conrad the Younger, was named Count of Worms by Emperor Henry II while the Duchy of Carinthia passed to Adalbero of Eppenstein due to Conrad the Younger's infancy. Conrad the Younger was placed in Conrad's care. Conrad married Gisela of Swabia, a twice widowed duchess, in 1016. Gisela was the daughter of Duke Herman II of Swabia who, in 1002, unsuccessfully claimed the German throne following Emperor Otto III's death, losing the election to Emperor Henry II. Gisela was first married to Count Bruno I of Brunswick the same year. Following Bruno's death around 1010, Gisela married Ernest I of the House of Babenberg. By the marriage, Ernest I inherited the Duchy of Swabia at the death of Gisela's brother Duke Herman III of Swabia in 1012. This marriage produced two sons: Ernest II and Herman. After the death of Ernest I in 1015, Emperor Henry II named Ernest II as Duke of Swabia. As Gisela's new husband, Conrad hoped to serve as regent for his minor stepson in the administration of the duchy, seeing it as an opportunity to increase his own rank and subsequently make a claim for his own duchy. Emperor Henry II blocked this attempt by placing the guardianship of Ernest II, and regency over Swabia, in the hands of Archbishop Poppo of Trier in 1016. This action further strained the already rough relationship between the imperial House of Otto and the Salian family. Conrad II's hopes of obtaining his own duchy failed, but his marriage to Gisela brought him wealth. Her mother, Gerberga of Burgundy, was the daughter of reigning Burgundian King Conrad of Burgundy and granddaughter of the late Frankish King Louis IV. Gisela also claimed descent from Charlemagne through both her mother and her father. The marriage was problematic because of the familial relationship shared by Gisela and Conrad: both were descendants of Ottonian King Henry I, Henry in the fifth generation and Gisela in the fourth. According to canon law, marriage was not allowed among relatives of the first to seventh generations. Though Conrad's marriage differed little from the usual practice of the time, strict canonists took exception to the marriage and Emperor Henry II used this breach of canonical law to force Conrad into temporary exile. During this exile, Gisela bore Conrad a son, Henry III, on October 28, 1017. Conrad and Emperor Henry II were eventually reconciled, allowing him to return to Germany. Emperor Henry II died in 1024. Childless, Henry's death brought the Ottonian dynasty, which had ruled Germany since 919, to an end. Without a clear successor as King of Germany, Henry's widow Cunigunde of Luxembourg served as regent while the German dukes gathered to elect a new king. Cunigunde was assisted by her brothers Bishop Dietrich I of Metz and Duke Henry V of Bavaria. Archbiship Aribo of Mainz, the Primate of Germany, also assisted Cunigunde. On September 4, 1024, the German princes gathered at Kamba, an historical name for an area on the east banks of the Rhine River opposite the German town Oppenheim. (Today the position of Kamba is marked by a small monument, which displays Conrad on a horse.) Archbishop Aribo served as the assembly's president. Conrad presented himself before the assembly as a candidate for election, as did his younger cousin Conrad the Younger. Both were descendants from Emperor Otto I by their common grandfather Otto of Worms, son of Liutgarde, one of Otto's daughters. Although other extended members of the Ottonian dynasty existed, none were seriously considered for election. The chronicler Wipo of Burgundy, Conrad's chaplain, attended the meeting and recorded the election. The Duchy of Saxony adopted a neutral strategy while the Duchy of Lorraine favored the younger Conrad. A majority of the assembled princes favored the elder Conrad, whose seven-year-old son ensured a stable dynasty for the kingdom. As president of the assembly, Archbishop Aribo cast the first vote and supported the elder Conrad. He was joined by the other clergy in supporting the elder Conrad. The secular dukes then cast their votes for the elder Conrad as well. Only Archbishop Pilgrim of Cologne, Duke Gothelo I of Lower Lorraine, and Duke Frederick II of Upper Lorraine refused to support him. 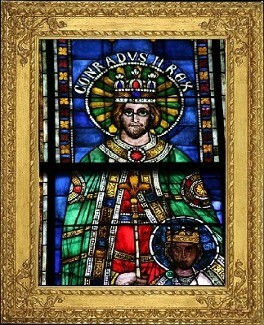 Conrad was crowned King of Germany by Archbishop Aribo in Mainz Cathedral on September 8, 1024 at the age of 34. To mark his election, Conrad commissioned the construction of the Speyer Cathedral in Speyer, near his ancestral home of Worms. Construction began in 1030. Archbishop Aribo, as archbishop of Mainz, was already the chancellor of Germany. Conrad wanted to reward the archbishop for his electoral support, so he made Aribo chancellor of Italy as well, making Aribo the second most powerful man in the Holy Roman Empire as the imperial chancellor. Aribo refused to crown Conrad's wife Gisela as queen due to a violation of canon law. Conrad refused to accept Archbishop Aribo's position. Archbishop Pilgrim of Cologne saw the situation as an opportunity to restore his relationship with the king, after refusing to support Conrad's election, and he crowned Gisela queen on September 21, 1024. The political reorientation of Pilgrim also weakened the opposition towards the new king. Conrad inherited a kingdom troubled by numerous problems. The duchies of Saxony and Lorraine were in opposition to his rule, as well as his cousin Conrad of Carinthia. To secure his reign, Conrad went on a tour of Germany, making stops in Augsburg to receive the support of Bishop Bruno, and at Strasbourg to receive the support of Bishop Werner, the brothers of the late Emperor Henry II. Both were appointed to high-ranking offices at Conrad's court. Traveling from Cologne to Aachen, the site of Charlemagne's old capital, Conrad continued the tradition of claiming the right to rule Germany as successor to Charlemagne. Despite the continuance of this Ottonian tradition, the Duchy of Lorraine still did not accept his rule. Conrad then traveled north to Saxony, visiting Abbess Adelaide I of Quedlinburg and Abbess Sophia I of Gandersheim, both daughters of the late Ottonian Emperor Otto II. Their support of Conrad's rule greatly influenced the Saxony nobility. Celebrating Christmas at Minden, the Saxon nobles, led by Duke Bernard II, recognized Conrad as their king after he promised he would respect Saxon law. Conrad and Gisela would remain in Saxony during the winter until March 1025. Upon leaving Saxony, Conrad traveled to the Duchy of Swabia, celebrating Easter at Augsburg. He then traveled to the Duchy of Bavaria to celebrate Pentecost at Regensburg. Conrad next traveled to Zurich near the German-Burgundian border. In 1016, Emperor Henry II forced the childless Burgundian King Rudolph III to name him as his heir. With Henry's death in 1024, Conrad claimed the same rights over Burgundy. This ended his tour of Germany, visiting all major regions of the kingdom within ten months of his election. Conrad had to address the longstanding Gandersheim Conflict upon assuming the German throne. The forty-year conflict stretched back to 989, during the reign of Emperor Otto III, over control of Gandersheim Abbey and its estates. Both the Archbishop of Mainz and the Bishop of Hildesheim claimed authority over the Abbey, including the authority to anoint the Abbey's nuns. Though Otto III eased the tensions between the parties by declaring that both bishops would anoint the Abbess, the conflict continued. Archbishop Aribo of Mainz, the new Primate of Germany, sought to overturn this precedent. Conrad was indebted to Aribo for his support during the royal election and worked to support his ally. In January 1027, the king called a synod at Frankfurt to resolve the dispute, but a conclusion was not reached. Conrad called a second synod in September 1028, which likewise failed to find a solution. Only a third synod in 1030 ended the conflict when Bishop Gotthard of Hildesheim renounced his claims to the monastery in favor of Aribo. During his travel to Augsburg, a conflict broke out between Conrad and his younger cousin Conrad the Younger. The reasons for the rebellion are not recorded, but the younger Conrad claimed he did not receive some compensation the king promised him for withdrawing from the 1024 election. In Bavaria, Conrad was brought into contact with the Italian ruling elite for the first time. In June 1025, Archbishop Aribert of Milan, and other bishops from Northern Italy, traveled north over the Alps to pay homage to Conrad. In exchange for certain privileges in the governing of Italy, Aribert agreed to crown Conrad with the Iron Crown of Lombardy. The situation in Italy was unstable after the death of the Henry II. The secular nobles believed the Italian throne to be vacant, not accepting Conrad's automatic succession as a matter of right. Instead, the secular nobles offered the Italian crown to the Capetian King Robert II of France and his son Hugh Magnus. After he rejected the offer, the secular lords approached Duke William V of Aquitaine. Though initially excited by the offer, William V subsequently rejected it as well. In addition to the ecclesiastical mission, secular Italian nobles from Pavia also traveled north to Conrad. While Conrad's election did not meet significant obstacles north of the Alps, in Italy, in the aftermath of the death of Emperor Henry II, there were several riots, and some Italian nobles attempted to separate the Kingdom of Italy from the Holy Roman Empire. When the news spread of Henry's death, the citizens of Pavia revolted, destroying the imperial palace, which dated to the Ostrogothic King Theodoric the Great during the 5th century. Though Pavia had lost is position as the seat of royal administration in Italy under the Ottonian dynasty, the palace had been a great symbol of imperial authority in Italy. Pavia, thanks to its strategic location situated on the trade routes from Italy to Burgundy and France, had become an important commercial center. Traders of the lower nobility demanded greater autonomy from imperial control. The nobility saw the mere presence of the imperial palace within the city walls intolerable. Ambassadors from Pavia traveled north to meet with the German king. According to Conrad's personal cleric Wipo, the Italian kingship was not "durable" with the German throne but instead a mere "personal union". Italy was a separate nation from Germany with its own identity, not a permanent political union. They tried to justify the actions of their fellow citizens, claiming that Pavia had always been loyal to the Italian king, as long as the king was alive, and that the revolt had taken place when the Italian throne was vacant. Therefore, the burning of the palace should be excused. Conrad rejected their argument, however, saying that just as a ship remains after the death of its captain, the Empire remains after the death of the Emperor. The kingship of Italy, according to Conrad, belonged to him as king of Germany as a matter of legal right. Conrad also declared that the palace was property of the Empire, not of the old king, and therefore the new king had the right to punish those responsible. The secular nobles returned to Italy in opposition to Salian rule. In February 1026, Conrad assembled an army of thousands of armored knights for an expedition into Italy, including troops commanded by both Archbishop Aribo of Mainz and Archbishop Pilgrim of Cologne. Conrad's army marched south, besieging Pavia, but the city walls blocked the attackers. Conrad decided to leave a contingent of soldiers to keep the city under siege, blocking all trade in the area, and continued his campaign. By March 1026, Conrad arrived in Milan and was crowned with the Iron Crown of the Lombards by Archbishop Aribert of Milan as King of the Lombards. From Milan, Conrad traveled to Vercelli, where he celebrated Easter with the aged Bishop Leo of Vercelli, who had been a chief advisor to the late Emperor Otto III. When Leo died a few days later, Archbishop Aribert became the chief supporter of the Salian dynasty in Italy. With Conrad's assistance, Aribert became highest ranking religious figure in Italy and oversaw the expansion of the Basilica of Sant'Ambrogio in Milan. In June 1026, Conrad marched with his army to Ravenna, but quartering his soldiers alongside the Ravennese population caused tension in the city. Conrad marched north to mitigate the risk the summer heat posed to his army. In autumn Conrad left his summer camp in the Po valley and marched to the Burgundian border. Conrad then celebrated Christmas at Ivrea. By the end of winter, the secular nobles of Italy voluntarily ended their opposition to Conrad's reign. Pavia, however, remained in revolt until early 1027 when Abbot Odilo of Cluny brokered a peace deal between the city and Conrad. On March 26, 1027, Pope John XIX crowned Conrad and his wife Gisela as Emperor and Empress, respectively, in Old Saint Peter's Basilica in Rome. The coronation was attended by Cnut the Great, King of England, Denmark and Norway, Rudolph III of Burgundy and 70 high-ranking clerics, including the Archbishops of Cologne, Mainz, Trier, Magdeburg, Salzburg, Milan, and Ravenna. Conrad's son and heir Henry also attended. Rudolph's attendance marked an improvement in the relationship between Burgundy and the Holy Roman Empire. During the seven-day coronation ceremony, a rank dispute between the archbishops of Milan and Ravenna arose, with Conrad deciding in favor of Milan. Following the synod, Conrad traveled south to receive homage from the southern Italian states of Principality of Capua, the Principality of Salerno, and the Duchy of Benevento. After his coronation, Conrad issued decrees to reorganize the monasteries and dioceses of Italy with the particular goal of bringing the church at Venice under Imperial control (see the Schism of the Three Chapters). On April 6, 1027, at a synod held in the Lateran Basilica with Pope John XIX, the Emperor resolved the dispute in favor of Old-Aquileia. The Patriarch of Aquleai Poppo had been a loyal supporter of Emperor Henry II, who appointed him as Patriarch in 1020 during the Emperor's campaign to reassert his authority in Italy. Conrad's action placed the church at Grado under Poppo's authority, securing Poppo's loyalty by making him the Emperor's to official in northern Italy. The synod ended the independence of the Grado church and limited the political autonomy of Venice. In so doing, Conrad broke with the policies of his predecessors and revoked Venice's privileged trading status. Toward the end of May 1027, Conrad returned north to Germany to attend the funeral of Duke Henry V of Bavaria at Regensburg. With the Duchy of Bavaria left vacant, Conrad asserted his right to name a next duke as a matter of royal prerogative, taking the unprecedented decision of naming his 10-year-old son Henry as Duke of Bavaria despite the existence of candidates with a better claim to the Duchy. Never before had the Bavarian Duchy passed to a non-member of the Bavarian ducal family. The young prince assumed the Bavarian dignity on 24 June 1027. Following Henry's appointment, Conrad held court at Regensburg and issued a decree requiring an accounting of all imperial property in the duchy. This required the various counts and bishops to report to Conrad all property they possessed in their castles and abbeys that belonged to the Emperor. Even the Dowager Empress Cunigunde of Luxembourg was required to report to Conrad, with the Emperor even claiming Cunegonde's wittum (money and property left to her by her late husband Emperor Henry II) as belonging to him. Conrad's promotion of imperial authority over the ducal succession and his claims to property throughout Bavaria caused tension between him and the German aristocracy, who viewed Conrad's actions as infringing upon their privileges. In 1025, Duke Ernest II of Swabia, Conrad's stepson from his marriage to Gisela of Swabia, rebelled against his stepfather when he was elected king of Germany. By 1026, Conrad had defeated the resistance and Ernest submitted to his reign. Due to the intervention of his mother Gisela, Ernest was allowed to accompany Conrad on his expedition to Italy in 1026. During the expedition, the rebellion led by Conrad of Carinthia and Count Welf II of Swabia continued. Conrad had named Bishop Bruno of Augsburg regent of Germany while he marched south to Italy. When Bruno was defeated by the rebels, Conrad sent Ernest back to Germany in September 1026 to end the revolt. When Ernest returned, he joined the opposition and rebelled against Conrad again. Conrad returned to Germany in 1027, after being crowned Emperor, and held court at Augsburg in Swabia, calling upon the rebels to surrender. Ernest, trusting in the number and fidelity of his vassals, rejected the peace officer, and appealed to his Swabian counts to join him in rebellion. According to Wipo of Burgundy, the counts refused, stating that while they had sworn loyalty to Ernest, but they would not rebel against their Emperor. Without the support of the Swabian counts, Ernest, Conrad of Carinthia and Count Welf submitted to Conrad at Worms on September 9, 1027, ending the rebellion. Conrad stripped Ernest of his ducal title and imprisoned him at Giebichenstein Castle in Saxony. Gisela supported Conrad against her son, but did not want Ernest to be entirely humiliated. As a result of his mother's intervention, Conrad allowed Ernest to retain his title while imprisoned, with Gisela serving as regent over the duchy. In 1028, after Conrad's son Henry was crowned as King of Germany, Gisela again intervened on Ernest's behalf. Conrad pardoned Ernest and released him from prison in 1028, but Gisela retained regency over Swabia. Ernest served as duke in name only. On Easter 1030, Conrad offered to restore Ernest his full powers as Duke of Swabia if he would crack down on the Emperor's enemies there. Ernest's refusal, especially against his friend Count Werner of Kyburg, resulted in his final downfall. Conrad stripped his stepson of his title, declared him a public enemy, and had him excommunicated. Even his mother Gisela did not come to his rescue. Within a few months, both Ernest and Werner were killed in battle against the Bishop of Constance near Falkenstein Castle (de) in the Black Forest. The fall of Ernest greatly weakened the independence of Swabia. Conrad named Ernest's younger brother Herman as the new Duke. Herman was a minor, so Conrad named the Bishop of Constance regent. Eight years later in 1038, Herman was dead and Conrad named his own son Henry as duke, securing imperial control over the duchy. Conrad had to enforce his royal prerogatives in the Duchy of Carinthia and the Duchy of Swabia. Duke Adalbero of Carinthia had been appointed as duke in 1012 under Emperor Henry II and remained loyal to imperial authority, supporting Conrad's election as German king in 1024. At a synod in Frankfurt in September 1027, Conrad attempted to resolve the decades' long Gandersheim Conflict. Adalbero accompanied the Emperor and acted as his sword-bearer during the proceeding, indicating Conrad's trust in him. From 1028 on, Adalbero governed his Duchy as an independent state. In particular, he attempted to conduct peaceful relations with the King Stephen I of the Kingdom of Hungary. Under Emperor Henry II, who was the brother-in-law to Stephen, relations between the Empire and Hungary had been friendly. Upon Henry's death in 1024, Conrad adopted a more aggressive policy, prompting border raids into the Empire from Hungary. The raids particularly affected Adalbero's domain of Carinthia, which shared a long, eastern border with Hungary. Conrad summoned Adalbero to court at Bamberg on 18 May 1035, to answer an indictment of treason for his actions regarding Hungary. In the presence of the German dukes, Conrad demanded that Adalbero be stripped of all his titles and lands. The dukes hesitated and demanded that Conrad's son Henry, the Germany's co-King and Conrad's designated successor, join the assembly before a decision was made. Henry refused to depose Adalbero, citing an earlier agreement with Adelbero to be his ally in negotiating a settlement between him and his father. Conrad resorted to exhortations, pleas, and threats to convince Henry to support Adalbero's deposition. Henry's support was soon followed by that of the other dukes. Conrad then ordered Adalbero to be removed as Duke and sentenced him and his son to exile. After attacking Conrad's allies in Carinthia, Adalbero fled to his mother's estates in Ebersberg in the Duchy of Bavaria, where he remained until his death in 1039.The duchy of Carinthia remained unoccupied until February 2, 1035, when Conrad named his cousin Conrad the Younger as the new duke. With the appointment, the three southern German duchies of Swabia, Bavaria, and Carinthia were all under the control of Emperor Conrad through his family members (his stepson Herman in Swabia, his son Henry in Bavaria, and his cousin Conrad in Carinthia). Control of the southern duchies allowed Conrad to continue the process begun under the Ottonian dynasty, centralizing the Emperors authority over the Empire at the expense of the regional dukes. Conrad broke with Ottonian tradition, however, in favoring a more strict means of controlling rebellious vassals. Whereas the Ottonians followed a policy of informal public submission and subsequent reconciliation, Conrad used treason trials to declare rebels as "public enemies" to legitimize his subsequent harsh treatment, as he had done with Ernest II of Swabia and Adalbero. The nobles saw use of these treason trials not as mere power shifts in favor of the Emperor, but as a cruel breach of German tradition. Conrad continued the Ottonian dynasty's policy of using the German Church as a vehicle for imperial control. Beginning in the 950s, the Ottonians had favored Church officials over secular nobles for appointment to the Empire's most important offices. Claiming "divine right" to rule the Empire, the Ottonians increasingly viewed themselves as protectors of the Church and thus demanded loyalty from the Church officials. In return, the various bishoprics and abbeys of the Empire were granted extensive landholdings and secular authority, providing immunity from the jurisdiction of the secular nobles. As such, the Church officials reported exclusively to the Emperor, acting as his personal vassals. As the Emperor's vassals, the Church officials were subject to providing two services to him: the servitium regis (royal service) and servitium militum (military service). Under royal service, the bishops and abbots were required to provide hospitality and accommodations to the Emperor and his court when he arrived. It also required the Church officials to act as quasi-bureaucracy for the Empire. Under military service, the Church was required to supply soldiers for the Emperors' army or to act as diplomats at his direction. Conrad energetically continued this tradition. In his biography of Conrad, the chronicler Wipo of Burgundy stated the promotion of the Church was of little value to the Emperor. Conrad and the other members of the Salian dynasty had little interest in the founding of new monasteries. Through their hundred-year dynasty, the Salians only founded one: Limburg Abbey which was converted from a fortress to a monastery in 1025. The Ottonians established at least eight in their hundred-year reign. Additionally, the Ottonians were active in the establishment of Church affairs, but Conrad was uninterested, only calling five synods during his reign and usually only to restore peace. Conrad's decisions on Church policy were often left to his wife Gisela of Swabia. When Archbishop Aribo of Mainz, Primate of Germany, died in 1031, Conrad considered both Abbot Bardo of Hersfeld Abbey and the renowned theologian Wazo of Liège, then serving as the dean of the cathedral chapter for the Bishop of Liege. Though Conrad favored Wazo to lead the German Church as Archbishop and Primate, Gisela convinced him to appoint Bardo instead. Duke Boles?aw I of Poland warred with Emperor Henry II three times during the German-Polish Wars from 1002 to 1018. In January 1018, Henry II and Boleslaw I signed a peace treaty, known as the Peace of Bautzen, in which the Empire and Poland declared a permanent peace with Boles?aw recognizing Henry II as his nominal feudal lord. In return, Henry II granted to Boleslaw lands on the Empire's eastern border. To seal the peace, Boles?aw I, a widower, reinforced his dynastic bonds with the German nobility by marrying Oda of Meissen, daughter of the Saxon Margrave Eckard I of Meissen. Empire and Poland remained at peace for the remainder of Henry's reign. Henry's death in 1024 gave Boleslaw an opportunity to increase his own power. Boleslaw took advantage of the interregnum in Germany and crowned himself king on Easter, April 25, 1025. Boleslaw was thus the first Polish king as his predecessors had been considered mere "dukes" by both the Empire and the Pope in Rome. Boleslaw died within two months of the coronation, most likely due to an illness. Boleslaw's son, Mieszko II Lambert, succeeded him as King, being crowned on Christmas Day 1025. Upon assuming the Polish throne, Mieszko expelled his older half-brother Bezprym and his younger brother Otto Boleslawowic. Otto went to Germany to seek Conrad's protection. Conrad considered the assumption of the title "king" by Mieszko an act of war and a disregard of his imperial authority, but had to address domestic issues before marching against Mieszko. In 1026 Conrad II marched into Italy to assert German authority south of the Alps and to claim the imperial crown from the Pope. In his absence, Duke Ernest II of Swabia, Conrad the Younger, and Duke Frederick II of Upper Lorraine rebelled against his authority. The rebels sought the support of Mieszko, which the Polish king granted and promised to take military action against Conrad. Conrad returned to Germany in mid-1027, putting an end to the rebellion before Mieszko could marshal his forces. In preparations for his own invasion of Poland, Conrad developed a closer relationship with Cnut, King of England and Denmark (whose kingdom lay along the Empire's northern border). Cnut accompanied Conrad to his coronation as emperor in 1027, and Conrad granted authority over the March of Schleswig, the land-bridge between Denmark and Germany. Fearing a joint German-Danish attack, Mieszko invaded the Empire's March of Lusatia and the territory of the Lutician Federation in 1028. The Lutici were a federation of West Slavic Polabian tribes that developed in the 10th century. Located on the northeast border of Germany, the Lutici were the regular target of German aggression during the early years of the Ottonian dynasty with Emperor Otto I's lieutenants Herman Billung and Gero, subjugating many of the Slavic tribes beginning in the 940s. In 983, as part of the Great Slav Rising, the Lutici initiated an open rebellion. In the ensuing war (983-995), the Lutici succeeded in reclaiming their independence and gained control of the Billung March and Northern March from the Empire. Though Emperor Otto III allied with Duke Boles?aw I of Poland to reintegrate them into the Empire, Otto III's death ended the friendly relationship between Poland the Empire. Instead, Boles?aw competed with Otto III's successor, Emperor Henry II, for dominion over the Lutici, causing Henry II to ally the Empire with the Lutici against Poland. Under the Peace of Bautzen in 1018, all three parties remained in uneasy peace, with Poland allowed to hold the Empire's Margraviate of Meissen. Of the eastern marches, the Empire only retained the March of Lusatia. Mieszko's 1028 invasion ended the peace. The Lutici sent ambassadors to seek Conrad's protection against Mieszko, which Conrad granted and renewed the German-Lutician alliance. Seeking to protect the Lutici from Polish invasion, Conrad launched a counter-invasion in 1029 and placed the Polish-held Bautzen under siege. Faced with a potential invasion by Hungary and the failure of the Lutici to provide their promised contingent of troops, Conrad retreated. In 1030, Poland secured an alliance with Hungary, with Stephen I invading Bavaria while Mieszko invaded Saxony. Conrad responded by allying with Yaroslav the Wise, Grand Prince of Kiev, to attack and capture Red Ruthenia on Poland's eastern border. In 1031, Conrad concluded a peace treaty with Hungary by ceding territory in eastern Carinithia to Hungarian control. Freed from the threat of Hungarian attack, the Emperor was able to focus his attention on attacking Poland. Marching on Mieszko in autumn 1031, Conrad laid siege at the Polish held-Bautzen in the Margraviate of Meissen. Mieszko's authority was shaken by the German and Kieven invasions, and the rebellion led by his exiled brother Bezprym. Mieszko surrendered to Conrad in fall 1031. Under the Treaty of Merseburg, Mieszko returned control over the Margraviate of Meissen and the March of Lusatia to the Empire. Soon after Mieszko concluded peace with the Empire, he was deposed by his half-brother Bezprym. When Mieszko assumed the Polish throne in 1025 he exiled his brother, who fled to the protection of Kievan Rus to the east of Poland. With Meiszko's position weakened by his wars with the Empire, Bezprym, supported by Conrad, persuaded the Kevian Grand Price Yaroslav I the Wise to invade Poland and install Bezprym as the country's ruler. The Kievan invasion was a success. Mieszko fled to the Duchy of Bohemia where he was imprisoned and castrated by Duke Oldrich in retribution for Mieszko's father Boles?aw's blinding Duke Boleslaus III, Oldrich's brother, thirty years earlier. Shortly after taking power, Bezprym sent the Polish royal crown and regalia to Conrad, officially renouncing the title "king" in favor of the traditional title "duke" and accepting the overlordship of the Empire over Poland. The Royal crown and regalia were delivered by Mieszko II's wife, Queen Richeza. Bezprym's reign was short. Bezprym's extreme cruelty caused his half-brother Otto Boles?awowic to lead a conspiracy. Bezprym's own men murdered him in spring 1032, created a power vacuum in Poland. Conrad responded by holding an assembly at Merseburg in 1033 to address the situation. Conrad's wife, the Empress Gisela of Swabia, interceded on Mieszko's behalf and requested he be freed from imprisonment in Bohemia and allowed to regain the Polish throne. Under the terms of the Treaty of Merseburg, Conrad divided Poland between Mieszko, Otto, and another half brother Detric. Mieszko was allowed to retain the title Duke and nominal authority over all of Poland. With a strong central leader to guide it, the treaty significantly increased the Empire's influence over Poland. The division was short-lived: in 1033 Otto was killed by one of his own men, and Mieszko II took his domains. Shortly after, Mieszko expelled Detric, reuniting the whole country in his hands. Though Mieszko regained his former power, he still had to fight against the nobility and his own subjects. Mieszko did not accept Bezprym's renunciation of the Polish crown and continued to style himself as "King" instead of "Duke". Mieszko II died soon after in 1034, and upon his death, a Pagan reaction in Poland erupted. Subsequently, his wife Richeza and son Casimir I fled to Germany. The Duchy of Bohemia was incorporated into the Holy Roman Empire in 1004 during the German-Polish Wars, which stretched from 1002 to 1018. Emperor Henry II installed Jaromir as Duke of Bohemia and promised protection against Polish aggression in return for incorporation. Jaromir ruled only a smaller territory, however, as Poland occupied the traditional Czech territories of Moravia, Silesia, Lesser Poland and Lusatia. In 1012, Jaromir was deposed by his brother Oldrich, who assumed the Bohemian throne for himself. Following the resumption of hostilities between the Empire and Poland in 1028, Oldrich went on the offensive against Poland, reconquering Moravia by 1029, which helped to stabilize his duchy. The war ended in 1031 when Polish King Mieszko II surrendered to Conrad. In the civil war which followed, Meiszko was forced to flee Poland for Bohemia, where Oldrich had him imprisoned and castrated in revenge for the torture Meiszko's father, Boles?aw I of Poland, inflicted upon Duke Boleslaus III, Oldrich's brother, thirty years before. Poland was unable to stabilize in the wake of Mieszko's exile, forcing Conrad to convene an assembly in July 1033 to issue the Treaty of Merseburg which restored Meiszko to the Polish throne. Conrad summoned Oldrich to appear to the assembly, but Oldrich refused. 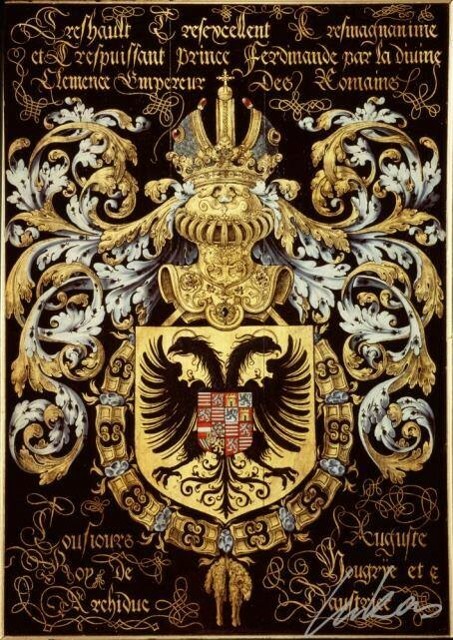 His absence raised the ire of the Emperor and Conrad, busy with securing his succession to the Burgundy throne, charged his son Duke Henry of Bavaria with punishing the recalcitrant Bohemian. At age 17, Henry's march on Bohemia was his first independent military command. The expedition was complete success, with Henry deposing Oldrich and restoring his brother Jaromir to the Bohemian throne, with Oldrich's son Bretislaus I appointed as Count of Moravia. Oldrich was imprisoned in Bavaria but by 1034 was pardoned and allowed to return to Bohemia. Oldrich deposed and blinded Jaromir, reclaimed the Bohemian throne, and exiled his son. While the reason for the conflict between father and son has been lost, it is believed Bretislaus supported Jaromir over his father. Oldrich died suddenly on November 9, 1034, allowing Bretislaus to return from exile. Though Jaromir was offered the throne, he declined in favor of his nephew. Bretislaus was then installed as the new Duke of Bohemia by Conrad. With Otto III's approval, Stephen was crowned as the first Christian king of Hungary on Christmas Day, 1000. Otto III's successor, Emperor Henry II, was Stephen's brother-in-law by Stephen's marriage to Henry's sister Gisela, furthering the friendly relationship between the Empire and Germany. Under Conrad, however, relations quickly turned hostile as Conrad pursued a more aggressive policy regarding eastern Europe. Conrad II expelled Venetian Doge Otto Orseolo, the husband of Stephen's sister Grimelda of Hungary, from Venice in 1026. Conrad also persuaded the Bavarians to proclaim his own son, Henry, as their duke in 1027, although Stephen's son, Emeric of Hungary, had a strong claim to the Duchy of Bavaria through his mother. Emperor Conrad planned a marriage alliance with the Byzantine Empire and dispatched one of his advisors, Bishop Werner of Strasbourg, to Constantinople. The bishop seemingly traveled as a pilgrim, but Stephen, who had been informed of his actual purpose, refused to let him enter into his country in the autumn of 1027. Conrad's biographer, Wipo of Burgundy recorded that the Bavarians incited skirmishes along the common Imperial-Hungarian border in 1029, causing a rapid deterioration in relations between the two countries. In 1030, open conflict erupted. Conrad launched an invasion of Hungary, but had to retreat when the Hungarians successfully used scorched earth tactics. Conrad left matters in Hungary to his son Henry, so he could address his problems with his stepson Ernest II, the deposed Duke of Swabia. Henry settled the conflict by 1031 by granting lands between the Leitha River and Fischa River in eastern Bavaria to Hungary. Hungary and the Empire remained at peace from 1031 through to Henry's own reign as Emperor in 1040. King Rudolph III of Burgundy, ruler of the Kingdom of Arles, had no sons, so Emperor Henry II was able to force the Burgundian ruler to name Henry as Rudolph's successor in 1016. Henry II was Rudolph's nephew, and his closest living male relative, as Henry II was the son of Rudolph's sister Gisela of Burgundy. When Emperor Henry II died in 1024, Rudolph was still alive, sparking a new controversy in the Burgundian succession. Conrad II, as Henry II's successor, claimed he inherited Henry II's rights, but Rudolph disputed his claim. Count Odo II of Blois, who had familial ties to Rudolph, also claimed a right in the succession. Conrad II met Rudolph in August 1027 near Basel to settle the dispute. Henry II's widowed wife, the Empress Cunigunde of Luxembourg, mediated between the two parties. A settlement was reached that allowed Conrad II to succeed to the Burgundian throne upon Rudolph's death under the same conditions as Henry II. In return, Rudolph was allowed to retain independent rule over his kingdom. Rudolph died on September 6, 1032, while Conrad was campaigning against Duke Mieszko II of Poland. Having forced Mieszko II to surrender, Conrad marched with his army to Burgundy in the winter of 1032/1033. Count Odo II of Blois, Conrad's former rival for the Burgundian throne, had already invaded the kingdom to secure his rule, controlling large portions of the kingdom's western territories. On February 2, 1033, Conrad arrived at Vaud, where he held an assembly at the abbey of Payerne and was crowned King of Burgundy. Initially, Conrad made little headway against Odo and had to withdraw to Zurich in March. After two large-scale military campaigns in summer 1033 and summer 1034, Conrad defeated Odo. On August 1, 1034, Conrad officially incorporated Burgundy into the Holy Roman Empire at a ceremony held in the Cathedral of Geneva. Though Burgundy was definitively under imperial control, the kingdom was allowed significant autonomy. Conrad rarely intervened in its affairs following his coronation, returning only in 1038 to name his son Henry as the kingdom's new ruler. The chief importance of the annexation of Burgundy was to augment the influence and dignity of the Emperor himself. Control of Burgundy did benefit the Empire. With Burgundy secured, the Empire controlled the western Alpine passes in Italy, allowing the Empire to secure its hold over Italy by blocking foreign invasions. Conrad formally confirmed the popular legal traditions of Saxony and issued new constitutions for Lombardy. In 1028 at Aachen, he had his son Henry elected and anointed king of Germany. Henry married Gunhilda of Denmark, daughter of King Canute the Great of England, Denmark, and Norway by Emma of Normandy. This was an arrangement that Conrad had made many years prior, when he gave Canute parts of northern Germany to administer. Henry, who would later become Emperor Henry III, became his father's chief counselor. Conrad campaigned unsuccessfully against Poland in 1028–1030. In 1031, Conrad and the Kievan Rus' forced King Mieszko II, son and heir of Boles?aw I, to make peace and return the land that Boles?aw had taken from the Empire during the reign of Henry II. Mieszko II was compelled to give up his royal title, and for the remainder of his troubled rule became the Duke of Poland and Conrad's vassal. In 1029 some Bavarian border conflicts undermined the good relations with Stephen I of Hungary. One year later Conrad launched a campaign against Hungary. The Hungarians successfully used scorched earth tactics, and Conrad had to withdraw his army. Finally, the Hungarian army forced him to surrender at Vienna. After his defeat, Conrad was obliged to cede some border territory to Hungary. Conrad upheld the rights of the valvassores (knights and burghers of the cities) of Italy against Archbishop Aribert of Milan and the local nobles. The nobles, as vassal lords, and the bishop had conspired to rescind rights from the burghers. Conrad restored order with skillful diplomacy and luck. In 1038, Prince Guaimar IV of Salerno requested that Conrad adjudicate in a dispute over Capua with its Prince Pandulf, whom Conrad had released from imprisonment in 1024, immediately after his coronation. Hearing that Michael IV the Paphlagonian of the Byzantine Empire had received the same request, Conrad went to Southern Italy, to Salerno and Aversa. He appointed Richer, from Germany, as abbot of Monte Cassino, the abbot Theobald being imprisoned by Pandulf. At Troia, he ordered Pandulf to restore stolen property to Monte Cassino. Pandulf sent his wife and son to ask for peace, giving 300 lb of gold and a son and daughter as hostages. The Emperor accepted Pandulf's offer, but the hostage escaped and Pandulf holed up in his outlying castle of Sant'Agata de' Goti. Conrad besieged and took Capua and gave it to Guaimar with the title of Prince. He also recognised Aversa as a county of Salerno under Ranulf Drengot, the Norman adventurer. Pandulf, meanwhile, fled to Constantinople. Conrad thus left the Mezzogiorno firmly in Guaimar's hands and loyal, for once, to the Holy Roman Empire. During the return trip to Germany an epidemic broke out among the troops. Conrad's daughter-in-law and stepson died. Conrad himself returned safely and held several important courts in Solothurn, Strasbourg, and Goslar. His son Henry was invested with the kingdom of Burgundy. A year later in 1039 Conrad fell ill and died of gout in Utrecht. His heart and bowels are buried at the Cathedral of Saint Martin, Utrecht. His body was transferred to Speyer via Cologne, Mainz, and Worms, where the funeral procession made stops. His body is buried at Speyer Cathedral, which was still under construction at this time. During a major excavation in 1900 his sarcophagus was relocated from his original resting place in front of the altar to the crypt, where it is still visible today along with those of seven of his successors. A biography of Conrad II in chronicle form, Gesta Chuonradi II imperatoris, was written by his chaplain Wipo of Burgundy, and presented to Henry III in 1046, not long after the latter was crowned.